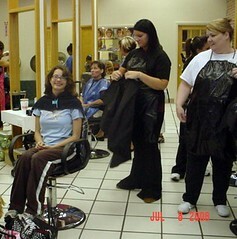 Last week Kelsie went to Blaine Beauty school to have her hair dyed. Her best friend's mom Barbara (the blonde) set her up with one of the other women and off she went. Barbara was kind enough to bring her home so we didn't have to sit there for the 3 hour event. Kelsie came home and didn't look any different until............. she lifted her hair. Apparently she decided to color the underneath of her hair and not the top....strange child. I think though she is going to go back and have some streaks put in it. She looks very cute nevertheless. This past week at work we sent a basket to one of the women who had a little boy a couple of weeks ago. His name is Max and he is a cutie. I made a few adjustments to the angel booties by Julie and had a great little pair of booties made from yarn that I was given in a swap. A very easy and quick knit. Next week I need to make a hat for another baby. Don't these babies know I have a silly sock to finish?!?! Imagine my surprise when I received this email: You have won a prize from Blogger Bingo. Mary and I participated in Blogger Bingo at Rhinebeck. I was a square both Saturday and Sunday as well as a player and Mary was just a player. Mary was a doll and since I am not the most outgoing person, she played both cards. I wore the button and talked to people when they approached me but I am not real forward. (stop laughing, Julie) So of course when Mary saw that particular email she said HEY! I am the one that played – how come you won. Well it seems that Stitchy McYarnpants and Mr. McYarnpants did a random drawing and my number came up. I won some wonderful lace weight alpaca from Briar Rose in an autumn colorway. I can’t wait to see it. I have also been knitting and crocheting up a storm this past week. I came back from Rhineback and seem to be a woman possessed. Since a week ago Wednesday, I have started and finished one of Jared’s fingerless mitts using his hand-dyed yarn and Dashing from Knitty.com. I finished Kelsie’s embossed leaf sock that has been on the needles since May. Started the Celtic Braid sock for a xmas present (can’t say who it is for, it is a surprise) and have made about 20 3x3 crochet granny squares for a scarf. And I worked all week. My, maybe I need to be one with the yarn more often. I know that I haven't posted for a while but it has been quite a couple of weeks. A week and a half ago, Kathy and I invited the knitting ladies up to camp to do some dyeing in the wilds of New Hampshire. All summer long we have talked about all the critters that visit us while we are at camp. Do you think ONE of them would come when the knitters were there? NOOOOOOOOOO of course not. (I personally think that they thought that Carolyn was there and didn't want to scare her) but....there was nothing I could do. Mary pleaded with the turtles to at least come out for a bit...but no...they would have none of it. So what did we do? We dyed, laughed, ate and even sat around the fire for a bit. I believe a good time was had by all and hopefully we will do it again next year at our new campground. Look at Dye Party Part 2 for photos of the fun day. Oh yea did I mention that the day after the dyeing party we had to pack up camp and get everything ready to move to the new campground? This is something that we (us, Kathy and Jim) have been planning for sometime now. The only problem? The man that was moving the trailers could only do it on Thursday. That left me out of the loop, but Mary, Kathy and Jim were back up at camp on Thursday to make sure that everything went smoothly and to pack and unpack the UHaul truck that was rented to get everything (grill, tarp, tables, etc) over to the new campground. Oh the new campground's name is Hillcrest. They are great. The owners are a super couple named Pat and Bob. They have even asked Kathy and I if we would like to host a knitting group on Sunday mornings...WOOO HOO. On Saturday night we went to the Deerfield fair with Mary's sister Jeannie and Joe, their neice Patty and her bf Jim and her little guy Jonathan. It was fun, we got to see all the farm animals, lots of sheep, Icelandic Sheep, Tunis Sheep North Country Cheviot, some baby pigs, and some goats, we also ate our weight in fair food. We also saw a spinning demo, a woman doing some needle felting and an entire stall filled with fiber arts. Very cool. Work is great, now that my computer is once again working properly. It has been frustrating the last couple of days while I waited to have it fixed. I am finishing up Kelsie's green embossed leaf socks. They were on hold for a bit again as I need to knit something for ACMoore. 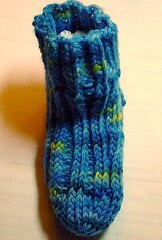 Next on the needles will be some fingerless gloves for Jared and then xmas presents. Rhinebeck in a couple of weeks. I am very excited. I am particapating in Rhinebeck Bingo. I am a player and a square for Saturday and Sunday so look for me. I will have my orange bag and some other distinct items that I will let you know about closer to the time. What did you do this weekend? We dyed!!! What a great Saturday we had. Jared, Kelsie, Julianne, Kathy, Mary and even Jim and I had a wonderful time dyeing some yarn. I had 5 skeins of sock yarn, Kathy had 1, we had some dk weight yarn, and even some worsted weight. We started out around 12:00 and we dyed until 6:00. Everyone had a turn. Jim supervised and was a great help with organization. I started it out as I was the only one who had ever dyed and I had a custom request from Cheryl for a swap that she is in. She needed yellow and green yarn. Then Jared was up. He wanted to do his blue, but not solid blue. He used Navy, Blue and we even mixed those together so that he had a third shade that we called Medium Blue. It was fab. Then it was Julianne's turn. She also used the Medium Blue and the regular Blue but she added the two shades of purple, Regular Purple and Brite Purple. Again a great looking skein of yarn. Kelsie was next. She used her own unique technique. She painted the skein long ways. First Scarlet, then Orange, then Yellow. I can't wait to see what that looks like caked up. We also decided that we would try dyeing like the Native Americans did. Kelsie got busy picking black raspberries and Jared went looking for birch leaves. The raspberries looked and smelled yummy, the birch leaves not so much so we added coffee and tea bags to make the yarn a little browner. It worked just great. Then Mary got to work. She picked Scarlet, Blue and Black for her yarn. She was very very precise in her work. Making sure that each color was exactly the same size. As always it was exactly the way she wanted it. Kathy went next. She also used Scarlet and Orange and a tiny bit of Yellow but with totally different results. Great! Then it was my turn. I did an Orange and two shades of Purple. Not sure I love it. Then I did a rainbow one. Now as a small child I learned a poem that went, Red, Orange, Green, Blue, shining Yellow, Purple too. All the colors that you know live up in the rainbow. The kids all protested that was not the correct way to do it....BUT I won! Next it was on to a Scarlett one that I splattered with black spots and another raspberry one that I added some Purple too. OOO and Jared did a completely black skein of some 2 ply to go along with the 2 ply that we dyed brown. By the end we were covered in dye (sorry Julie) and very tired but very happy. Please check out the Dyeing Party Photo Album for all the photos.